By Fred L. Perry, Jr.
Now in its third edition, this popular introduction to the foundations of research methods is designed to enable students and professionals in the field of applied linguistics to become not just casual consumers of research who passively read bits and pieces of a research article, but discerning consumers able to effectively use published research for practical purposes in educational settings. All issues important for understanding and using published research for these purposes are covered. Key principles are illustrated with research studies published in refereed journals across a wide spectrum of applied linguistics. Exercises throughout the text encourage readers to engage interactively with what they are reading at the point when the information is fresh in their minds. Intended for and field-tested in courses in MA-TESOL/TEFL and applied linguistics programs, course instructors will find that this text provides a solid framework in which to promote student interaction and discussion on important issues in research methodology. This book provides an excellent foundation for those who plan to continue in an active research agenda. Companion Website (www.routledge.com/cw/Perry) with list of journals related to applied linguistics, annotated resources to aid students and instructors for each chapter, access to screencasts and YouTube demonstrations, and a space for students and/or teachers to interact with the author. 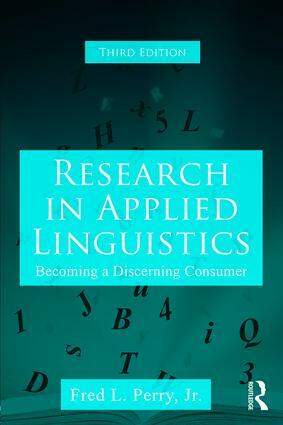 Fred L. Perry, Jr. is Professor Emeritus of Applied Linguistics at the American University in Cairo, Egypt.